Hamilton War Horse was unveiled in Hamilton’s Memorial Park on Armistice Day, 11 November 2017. A statue commemorating New Zealand’s war horses has been unveiled in Hamilton’s Memorial Park following this year’s Armistice Day Service on November 11. A march led by six Clydesdale horses pulling a one and a half ton WW1 artillery gun, followed by three armoured army vehicles, the Waikato Mounted Rifles and eight War Horse March Riders made their way through town to Memorial Drive to attend the official unveiling. 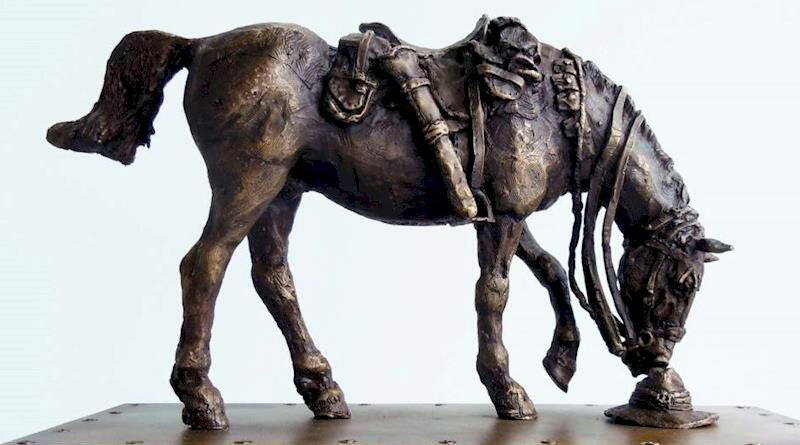 The $220,000 300kg life-size bronze statue was created by former Defence Force artist Matt Gauldie to honour the 8,000 horses sent to the South Africa War (1899-1902), and the 10,000 sent to the First World War. Only one horse ever returned from South Africa, and only four from the First World War. The piece was commissioned by the Waikato Combined Equestrian Group. President Noeline Jeffries said the statue’s completion was “a dream come true”. The majority of New Zealand horses were sent to the Sinai and Palestine. Matt Gauldie’s “big, awesome, bronze War Horse”. Jeffries picked up the challenge to commemorate New Zealand’s war horses from an article written by Rodney Marton of Masterton, late in 2012. He gave the first $5000 toward the project. Gauldie affectionately refers to the statue as the “big, awesome, bronze War Horse” and sculpted the horse searching for his fallen rider. “Moments earlier, it would have been charging through machine gun bullets at Beersheba. This would have been the most important and distressing time of this horse’s life and what the horse and rider trained for, for months,” Gauldie said. The battle of Beersheba was fought by the Australian and New Zealand Army Corps on October 31, 1917. This was the biggest charge of WW1 and victory over the Ottoman army allowed the Allies to capture Jerusalem. They then went on to the Jordan Valley to take Amman. Waikato Mounted Rifles Regimental Association president Major (Rtd) Simon Marriott said the history of the Waikato Mounted Rifles would always be linked with the employment of horses in war, and the great service they rendered during the South African War and the First World War, particularly during the desert campaigns in Sinai, Palestine and Syria. Matt Gauldie’s life-sized bronze Hamilton War Horse. “The horse gave the mounted trooper the priceless advantage of mobility, and with this came the ability to manoeuvre rapidly on the battlefield. Sadly, the cost was severe. Horses played a vital military role during both the previous two centuries and it is right that we should recall the hardship and losses they suffered on our behalf,” Marriott said. Following the unveiling a free one-off horse variety show ‘The Mane Event’ was held, to celebrate the love of the horse and its importance in New Zealand’s culture and history. The show began with the re-enactment of the arrival of the first horse in New Zealand, a gift delivered to Ngapuhi chief Ruatara by missionary Samuel Marsden, who also introduced Christianity to New Zealand, among other things. Jeffries gave riding lessons to The Very Reverend Peter Rickman, Dean of Waikato who starred as Reverend Samuel Marsden. Performances also included jousting, vaulting and a six-bar competition. Several limited-edition bronze collectable maquettes of both ‘Hamilton War Horse’ and ‘Leaping/Beersheba War Horse’ created by Matt Gauldie are to be available, with a percentage of proceeds going to the Waikato Combined Equestrian Centre Group and also towards the installation of a NZ War Horse statue at the International War Animals Memorial Garden, at Pozieres in northern France.